World of Patria International (WOPI) returns to the Duty Free Show of the Americas, 22-25 March in Orlando, this year to introduce a new theatrical drinking experience - Tofka. Tofka is a fusion of vodka with liquid caramel toffee. When shaken, the golden liquid swirls attractively, accentuating the premium nature of the product. Produced by Babco UK, Tofka is being offered to travel retail exclusively by WOPI as a versatile spirit that can be served in various ways: as a shot under shards of grated ice, over ice as a long serve or mixed into coffee or ice cream. Tofka comes in a 70cl bottle (28 shots) with an ABV of 29.9%. Ideal as a pre-drinking drink, party special or post-dinner liqueur, Tofka can be enjoyed neat or over ice. “It’s a fresh idea in an otherwise crowded market and is already going down ‘a storm’ on domestic markets where it has been introduced, including Australia and New Zealand,” adds Nichols. Supported by an active social media campaign, Tofka fits well into WOPI’s portfolio of premium and niche spirits, wines, beers and ciders, plus accessories and skincare products. Another focus in Orlando will be älska cider available exclusively to GTR from WOPI. Available in a distinctive sleek 33cl can, the stylish attractive pack aging gives this product a high standout value. The use of the icon 'ä' gives this cider a unique brand identity, its confident, attractive look communicates fruit and refreshment. 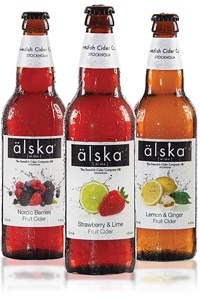 With a subtle, fruity and refreshing taste, älska is available in three flavours: Nordic Berry, Lemon & Ginger, and Strawberry & Lime. Particularly appealing to the female 'millennial' drinker; the product presented in attractive premium ‘travel-friendly’ packaging. Visitors to the Duty Free Show of the Americas are invited to try Tofka, älska and other premium products from the WOPI portfolio on its booth (1516) daily from 1700hrs.